The HP Reverb Virtual Reality Headset injects some much-needed innovation into the world of VR, with sharper screens and reengineered optics to enhance the fidelity and clarity of the digital world. The PC-based virtual reality space has been relatively quiet recently, without even a single rumor to suggest the Oculus Rift 2 might arrive to take on the HTC Vive Pro. We almost dared to say that desktop VR was all but done, as companies moved on to develop better standalone headsets like the Oculus Quest and HTC Vive Focus Plus. So HP caught us by surprise when it rolled out its new PC-bound VR headset, the Reverb. Featuring double the display resolution of the company’s previous model, the HP Windows Mixed Reality Headset, and an astounding complement of other improvements, this might well be the best VR headset to use on Windows – although whether that matters anymore will depend on how it can stack up against standalone headsets coming out later this year. The HP Reverb Virtual Reality Headset will be available to consumers by late April for $599 (about £450, AU$840). There will also be a commercial version available for a slightly higher $649 (about £490, AU$910) price. Both versions of the HP Reverb Virtual Reality Headset come with motion controllers included. The major differences between the consumer and commercial versions are that the latter comes with an additional short cable for connecting to a backpack PC, a leatherette face mask that you can just wipe to clean, and a more robust one-year warranty. At their core, though, the two models offer the same exact specs, so it really comes down to how much you value those bonuses on top of the consumer’s version more basic removable, machine-washable face mask and slightly more limited one-year consumer warranty. As for where the HP Reverb fits into the market, it’s less expensive than the $799 / £799 / AU$1,149 HTC Vive Pro. However, it costs slightly more than the only other new PC-based VR headset to hit the market in nearly a year, the $499 (about £380, AU$700) Samsung Odyssey+. When Windows Mixed Reality headsets first hit the scene, they all looked pretty much the same, with a slightly different front fairing to make them visually distinct. Well, we’re past that now – and HP has really reinvented its headset. The HP Reverb Virtual Reality Headset isn’t blocky like the HP Windows Mixed Reality headset that preceded it. If anything, it looks more like an Oculus Go thanks to its sleek, miniaturized frame that covers a significantly smaller percentage of your face. It also features a new fabric-lined front fascia to give it a bit more of the high-brow style you’d typically find on premium home audio and home entertainment products. What’s more, the halo-style headband has been replaced with a more supportive three-point band. Between the new headband and the much smaller headset, it feels like you’re not wearing anything at all when you have the HP Reverb Virtual Reality Headset strapped to your face. Along the sides of that revised headband you can also spot a pair of newly integrated headphones, while less apparent additions include built-in Bluetooth for connecting controllers, and the dual microphones that are now built into the headset. This really is a whole new headset; during our time with it, we couldn’t find a single element that was carried over from HP’s Windows Mixed Reality Headset. Enough talking about how the HP Reverb Virtual Reality Headset looks from the outside – how does it look when you peer through its new high-res screens? Well, it’s tack-sharp and much more highly detailed than its competition, thanks to its new 2160 x 2160 resolution per-eye panels, which enable this headset to deliver twice the display resolution than the HTC Vive Pro and Samsung Odyssey+, which only render 1440 x 1600 pixels per eye. Going from demoing the Samsung Odyssey+ to the HP Reverb was like night and day. Just standing inside Microsoft’s Cliff House environment, you can instantly see minute details with greater clarity, including something as mundane as the wood grain in the virtual floorboards. 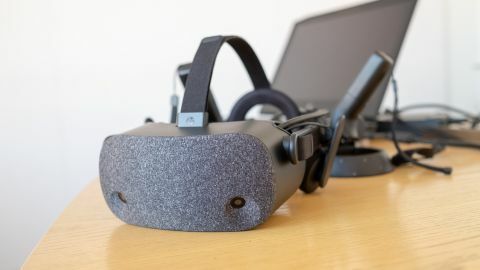 It isn’t just the sharper screen that allows this headset to render so much more detail; HP also re-engineered its optics to provide a clearer and wider vision of the virtual world. Firstly, the company moved away from perfectly symmetrical round lenses and created asymmetrical lenses with a squircle (square-circle) shape to provide a larger field of view. Additionally, the center of the lenses is now positioned closer to the bridge of the user's nose, and lens clarity has been improved by 33%. While you might think an incremental increase in visual fidelity might not add much to a virtual reality experience, it actually made us feel giddy about VR once again. It was like we were seeing VR with fresh eyes – and in a way, we were doing just that. Between the sharper resolution and the seamless 90+ frames per second refresh rate, Beat Saber and demos in the Valve Lab popped with new details we’d never seen before. At first, we were a little thrown off by the larger FOV and shaper image, causing us to miss a good number of targets with our slingshot in the Valve Lab or fail to swipe a musical cue at just the right time in Beat Saber. It might have just been us, but we feel you’ll need to take a little time to readjust to this new digital landscape as well. More good news is that you won’t need insane PC gaming hardware to power the HP Reverb Virtual Reality Headset. According to HP, users will merely need a Nvidia GTX 1070 to power their 4K virtual reality experiences, and you’ll likely be able to get away with using the even more affordable Nvidia GeForce GTX 1660 Ti. The PC-based virtual reality landscape has been barren for nearly a year now, with the HTC Vive Pro and Samsung Odyssey+ being the only noticeable additions. So to see HP come out with a dramatically higher-resolution headset is refreshing. While our early impressions of the HP Reverb are very positive, we’re itching to give this headset a full, long-term test so we can render our final verdict. It won’t be long before the HP Reverb Virtual Reality Headset comes to market, and you can be sure we’ll be revisiting it soon.